Fires can be accidentally started by welding sparks, this can sometimes happen when a welding, grinding or gas cutting operation has finished and premises left unattended. Avoid this serious safety hazard by using welding blankets and welding curtains. The welding curtains and blankets can protect workers and have the added benefit of shielding flammable materials. There are various materials available for producing welding blankets each with their own individual benefits. Welding curtains made from reinforced P.V.C. can be used to isolate an area. This can offer protection to workers from grinding sparks and light welding spatter. This material is certified to BS EN 1598 (Health and Safety in Welding and Allied Processes) Neoprene coated glass fibre fabric welding curtains can also be used to isolate an area. 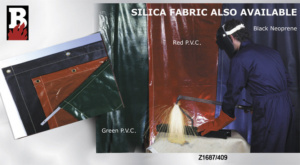 They have a high abrasion resistance and are also suitable as a fire cavity barrier Z1687/409 Welding Blankets can protect workers and have the added benefit of shielding flammable materials and machinery. Offering protection from molten metal globules / spatter up to 1000ºC / 1832ºF. This material is certified to BS 476 part 4 / Class ‘0’ and passed indicative test to BS 476 part 20. Silica Welding Blankets come with an abrasion resistant finish and are ideal for protection from molten metal spatter up to 1000ºC / 1832ºF. They are highly flexible and have great drapeability. For more information on welding blankets visit our website or call today!